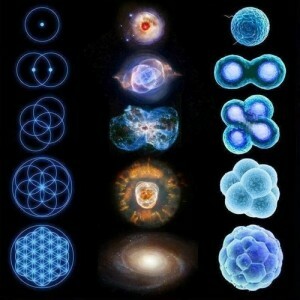 The Seed of Life is the blueprint of the Cosmos. 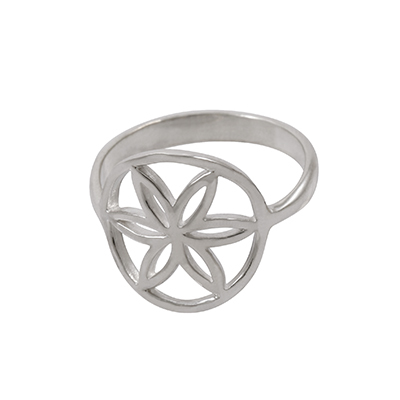 This symbol of sacred geometry, found in ancient temples, churches, synagogues and sacred texts from diverse cultures, represents the very unfolding of creation. 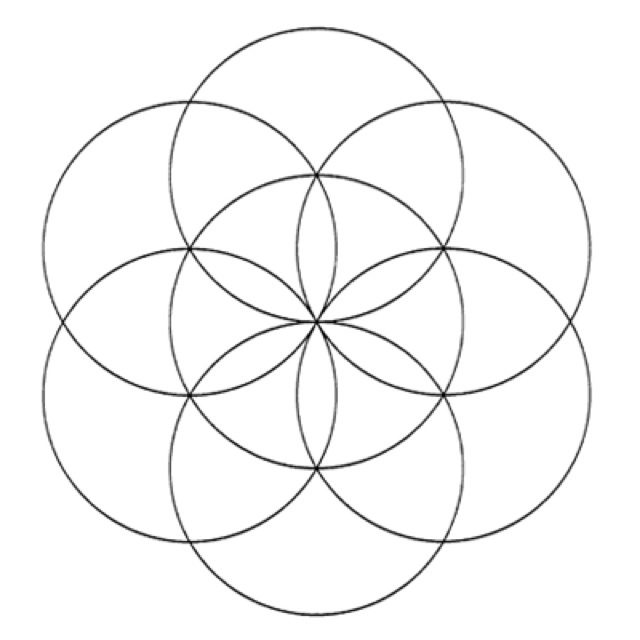 The Seed of Life consists of seven circles, six of which are arranged in perfect six-fold symmetry around the seventh to form what resembles a six-petal flower. 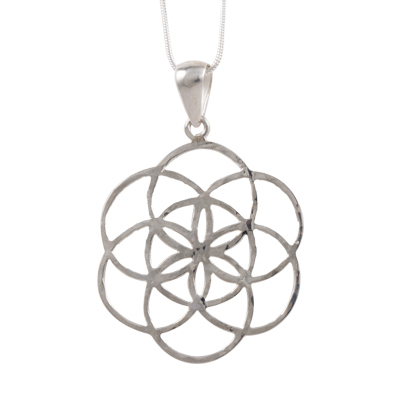 The seven circles of the Seed Of Life each represent the seven stages, or qualities, of creation. In the Old Testament, these 7 stages are symbolized as the six days of creation plus the seventh Sabbath day – the day of completion and rest. 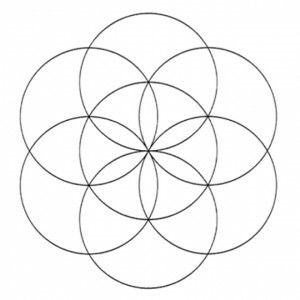 If you feel you’ve seen this flower pattern somewhere before, you’re probably correct, because the Seed Of Life is in fact the basic component of the well-known Flower of Life, which itself represents the matrix of all that exists (the fundamental forms of space and time and the very building blocks of all creation). 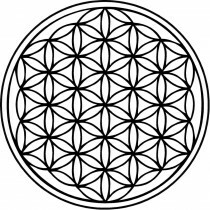 Notice how the Flower of Life is made up of many Seed of Life formations, but you cannot determine where one begins and the other ends! 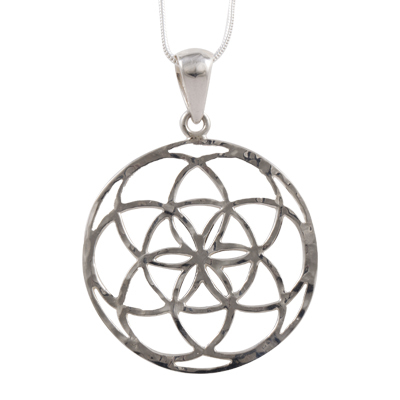 According to the principles of Sacred Geometry, Creation begins with the manifestation of a single octahedron – a geometric solid of eight equal sides, each side being an equilateral triangle. An octahedron is in fact two pyramids joined at their bases. The octahedron revolves on its three axes at great speed, all at once, to form a sphere. Within this sphere resides Pure Consciousness, the self-awareness of the Creator Itself. Beyond the Creator’s Self-awareness is complete nothingness (non existence), and the interface between the Divine Consciousness and non-existence is the surface of the sphere. Eventually, the awareness of the Creator expands beyond the boundaries of the sphere – that is to say, the Creator begins to reflect on Its own awareness, as if to observe Its Self (this is said to be the meaning in the biblical book of Genesis of the words, “And the spirit of God was hovering over the waters…”). In this process, a second octahedron manifests and revolves, to form a second sphere. 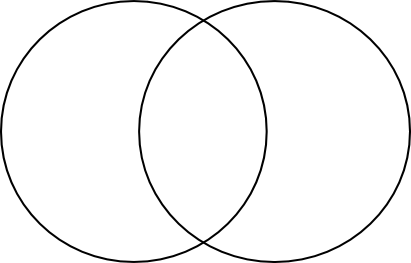 Where these two spheres intersect*, energy is generated and released as light (hence in the Old Testament, the Creator says, “Let there be light”). There is now the Creator and the created. 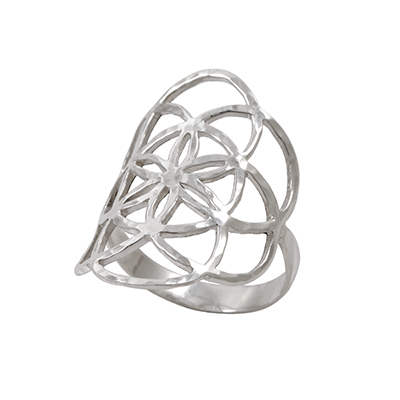 The concept of two spheres intersecting is itself a well-known symbol of sacred geometry known as the Vesica Pisces. This process of self-reflection, creation, energy generation and fractalization of the original sphere continues until the seventh sphere is produced, and a stable geometric pattern has formed – the Seed Of Life is now manifest and in turn it becomes the building block of a larger form, the Flower of Life (which in turn expands and forms the matrix for space and time and all matter). It is not much of a stretch of the imagination to see in the Seed Of Life the natural process by which the Universe and all Life have manifested – the expanding fractalization of the original sphere resembles both the expansion of the Universe from a single point (the Big Bang), and the division of a single cell into the multiple cells of an embryo. In meditating and reflecting on the Seed Of Life, we are striving to understand the source of all creation, the fractal and infinite nature of all being and the interconnectedness of all things! 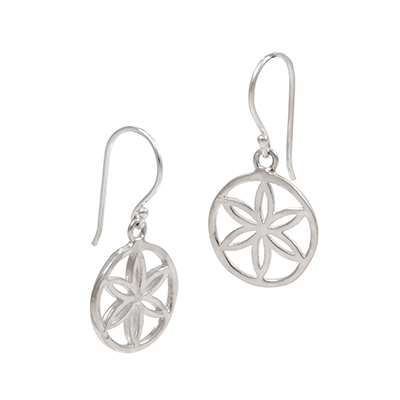 To find your most convenient stockist, please click here. Fore more information on the Seed Of Life, consider reading The Ancient Secret of The Flower of Life Vol.2 by Drunvalo Melchizedek.